How can I do the rest of the SF characters without including the Muay Thai Emperor !?! 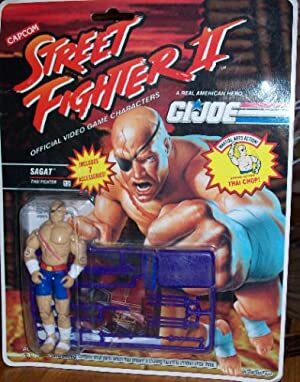 Sagat was the endgame boss in the original Street Fighter game, in 1987. He was then developed as a playable character and fleshed out to become less of a bad guy. At least some of the time, in some of the games. He might be one of the most prominent Thai fictional characters worldwide. Base Of Operations: Bangkok, Thailand. Height: 7’6″ Weight: 240 lbs. 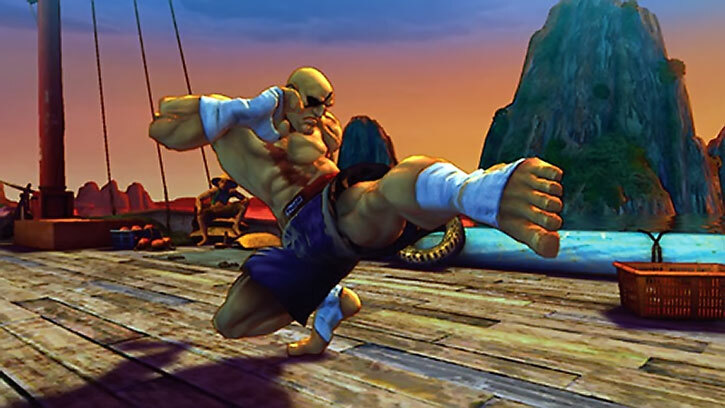 Sagat is said to be the greatest Muay Thai fighter to have every lived. He’s also one of most powerful martial artists in his world, and a huge man to boot. He can also, like a lot of other street fighters, channel his chi and throw energy blasts and leap to super human heights. Sagat was the Emperor of Muay Thai . The greatest Muay Thai fighter there was, but that wasn’t enough for him. He wanted to be the greatest fighter in the world. So he hosted the First Street Fighter 1 tournament to prove it. Great warriors from around the world came to do battle. 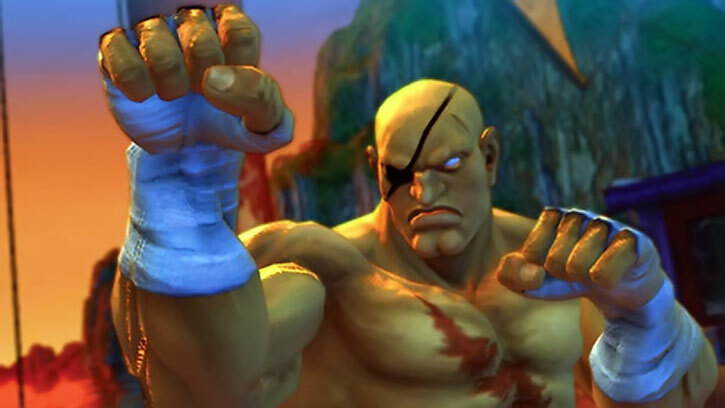 Sagat made his way to the finals, where he was up against a young man named Ryu. However, Ryu was no match for Sagat. 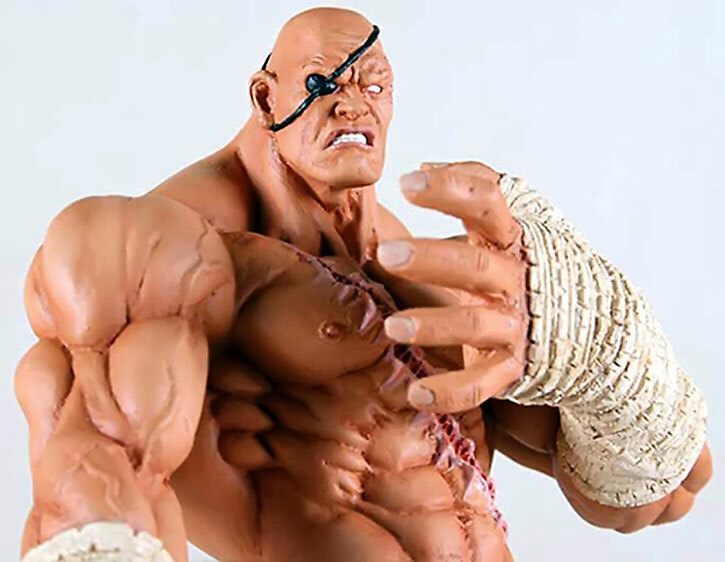 Seeing Ryu on the ground and that he was victorious, Sagat offered him a hand up. But then Ryu became consumed with a mysterious power and ripped through Sagat’s chest with a powerful shoryuken. He knocked Sagat out, winning the match. The attack left a physical scar as well as an emotional one that would last a long time. 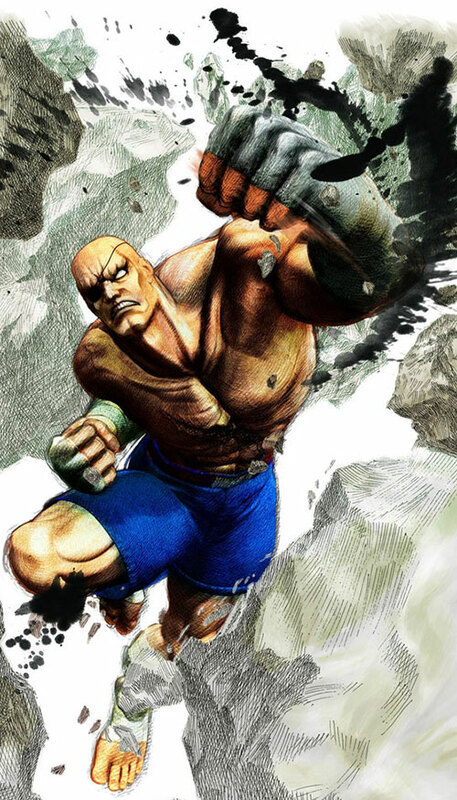 The enraged Sagat realized that he had lost the tournament because of a dishonorable cheap shot by Ryu. Sagat wasn’t the only one left with a bad taste in his mouth. Adon, his student, was mad, too. 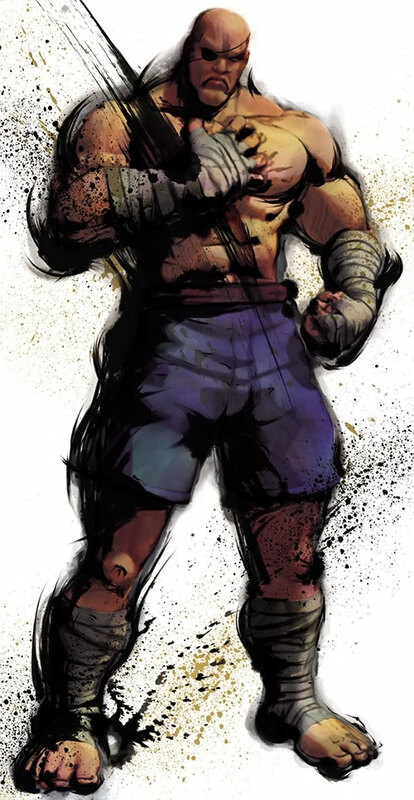 Adon was furious with Sagat for being unable to defend the name of Muay Thai from an upstart like Ryu. Adon conveniently forgot that he himself had lost to Ryu as well. Adon tracked Sagat and challenged him. 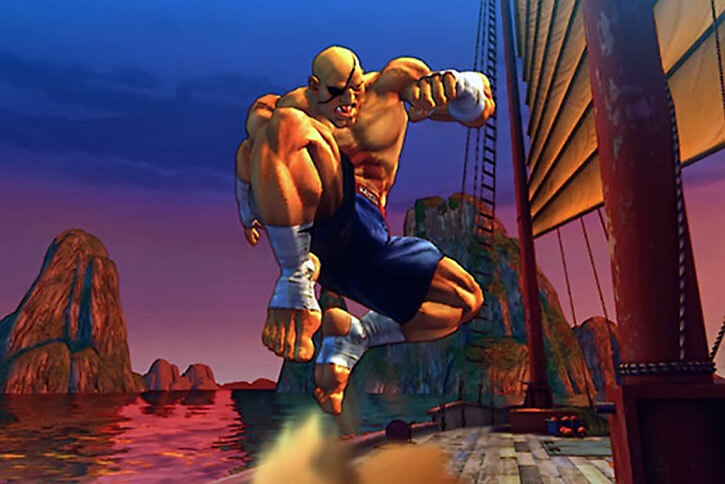 Sagat, however, was fueled by rage, and unable to focus on the battle. Thus Adon, despite being seriously injured, was able to defeat him and become the new Emperor of Muay Thai. Sagat had begun to realize that the power of vengeance is limited. He decided that he had to become stronger in order to defeat Ryu. Sagat also wanted to understand the true meaning of fighting. Thus, he told Master Bison that he needed a temporary leave from Shadaloo and that he would be back to learn about the psycho power that Bison told him about. Bison felt that his was reasonable and Sagat left to train. 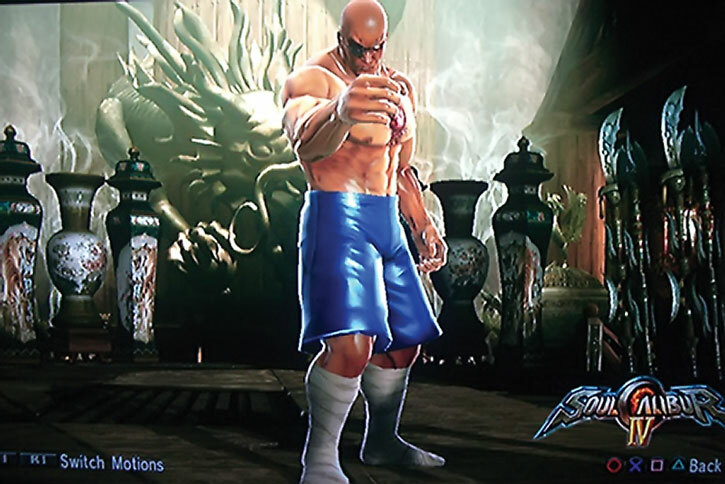 With the scar upon his chest as a constant reminder of his defeat, Sagat traveled. He continued his training and crushed one opponent after the other. Then one day he came across a fighter in a pink gi named Dan Hibiki. Dan himself was filled with rage upon seeing Sagat. He said that Sagat had killed his father and that he planned to avenge him. Seeing the rage in Dan’s eyes, and remembering how he had lost to Adon, Sagat began to realize that the power of hatred was limited. He began to feel guilt for all the opponents he crushed in anger, which included Dan’s father. Sagat now felt that he needed something other than hatred. Realizing this, he let Dan win the match and feigned being knocked out when Dan hit him. Shocked at his victory, Dan cheered, now that he had finally defeated Sagat and avenged his father! Seeing Dan’s happiness, Sagat realized the true meaning of honor. There was more to fighting than hatred, after all. Sagat returned to Shadaloo’s Thailand base to learn about psycho power, as promised. But he wound up learning about it, the hard way. Bison was back at the head of Shadaloo, and he had brainwashed Ryu and taught him about the psycho power. Sagat was disgusted that Bison would stoop so low. Fortunately, Ken and Sakura came in as they searched for Ryu. Sagat fought the mind controlled Ryu while Ken and Sakura fought Bison. After being defeated got up and began to shake off his brainwashing. Sagat demanded that Ryu not give in, because no true warrior would do so! With Sagat’s encouragement, Ryu overcame his brainwashing. He then hit Bison, forcing him to retreat. Sagat then told Ryu that he had trained hard in order to have his match against him. But Sagat now saw that Ryu still wasn’t ready. Ryu agreed that he still needed to train before they could have their final match, seeing as to how Ryu wasn’t strong enough to resist Bison. Seeing Ryu leave, and realizing the true meaning of the fight, Sagat was filled with excitement and eagerly awaited their next match. Hearing of the second Street Fighter 2 tournament being held, Sagat participated. He hoped to finally have his clean match with Ryu, but he didn’t get it. Sagat recalled how the title of Emperor used to mean something special, but that had changed. He prepared to train himself to be stronger for the next time he and Ryu would fight. Sagat still eagerly waits for a time when he and Ryu can finally test their skills against each other and see who is better. Sagat has probably seen more retcons than any other character in the Street Fighter universe. He’s been changed from arrogant egomaniac hell bent on revenge to an honorable, but hotheaded warrior. In this latter take he merely let rage and the desire for revenge cloud his judgement for a brief period before returning to an honorable warrior’s path. By his last appearance he’s mellowed quite a bit now only desiring a good clean match against his rival Ryu. Adrenaline Surge only works with Martial Artist, Energy Blast, and Jumping. Iron Nerves, Language (Thai), Leadership, Local Hero (Thailand). Muay Thai circuit (high), Ryu (low). Creepy Appearance (eye patch and huge scar on his chest), MPR (one-eyed). During his time with Shadaloo Sagat was a totally different guy. His motivation would’ve been Anti-heroic Seeking Justice and he would’ve had Serious Rage, SPI, and SIA (getting revenge on Ryu). His HP total would’ve been dropped to 70. He would’ve also had a High Connection to Shadaloo, Bison, and possibly others. By the end of the Alpha series he’s reformed, cut all ties with Shadaloo, and bought off all these Drawbacks. Capcom versus SNK, which’s basically a non-canon fantasy match, gave him a better projectile (enough to up his EB to 6). Source of Character: Street Fighter video games. 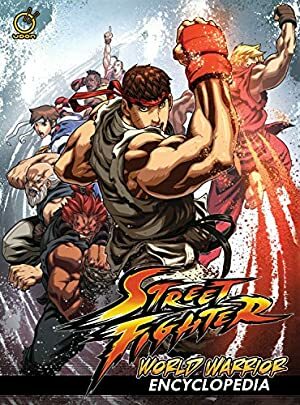 Helper(s): Sean McDonald (for the original take) GameFAQs (for everything that you ever wanted to know about the Street Fighter universe and more! ), Kal el Vigilante, Peter S Piispanen, Darci, Alan Wilkinson.